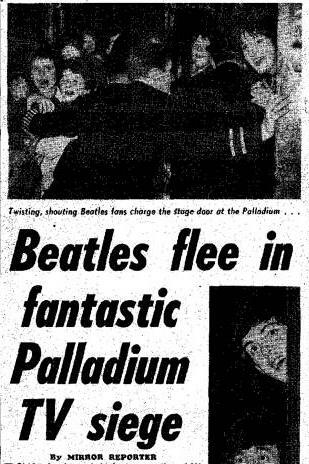 “Beatlemania” origin: 50 years ago, the Beatles played London Palladium, and the term Beatlemania was born. Brow Beat is following the Beatles in “real time,” 50 years later, from their first chart-topper to their final rooftop concert. Fifty years ago this month, the Beatles played one of their biggest concerts yet, prompting journalists to cover “Beatlemania” for the first time. 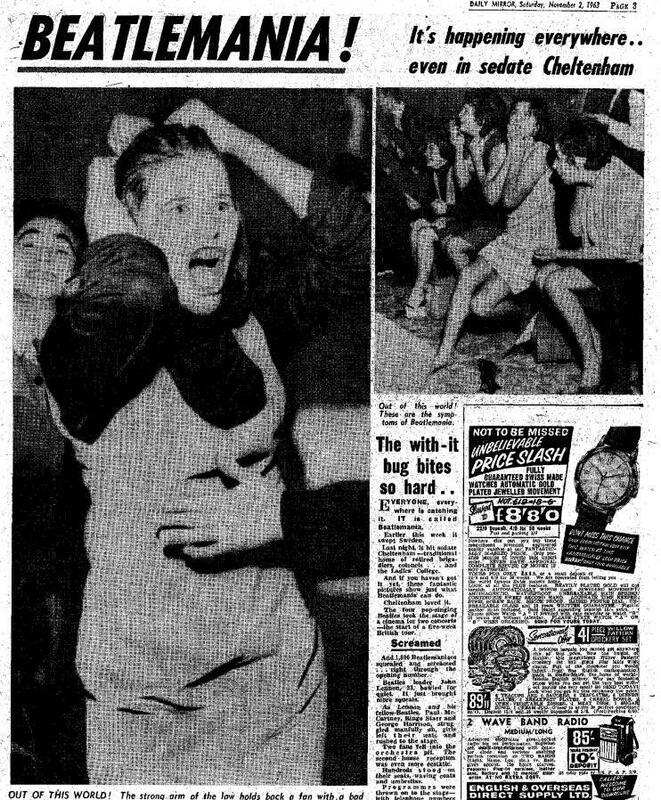 The Beatles had been driving fans into squealing fits of hysteria for months, but it’s only in October 1963 that “Beatlemania” was born. While the symptoms were nothing new—Elvis’ jittery hips had shook forth similar sounding shrieks almost a decade before, and the Beatles had done it even as an opening band—it’s only in October 1963 that journalists began to look upon the frenzied droves and make a now familiar diagnosis: Beatlemania. Regardless, the Beatles’ breakout concert in the U.K.—the one that them a regular fixture on the nation’s front pages—is no subject of controversy: It was the Beatles’ Oct. 13 performance on Val Parnell’s Sunday Night at the London Palladium. In the U.K., the show was as big as Ed Sullivan (which the Beatles wouldn’t play until months later), and drew up to 15 million viewers a night, and the Beatles were the headliners. The band, for their part, didn’t hold back, playing No. 1 hits “From Me to You” and “She Loves You,” “She Loves You” b-side “I’ll Get You,” and their rollicking version of “Twist and Shout.” The sound quality isn’t great, but you can listen to the whole performance below. Eventually the Beatles decided that, with crowds mobbing the stage door, they would do what fans least expected. After road manager Neil Aspinall pulled around the car, they made a break for it out the main entrance, as fans who had caught on chased after. This would soon become a common scene in the media, but in October 1963 the press was just beginning to catch on. The next month, Pathé News, “by generous permission of their famous manager Brian Epstein,” released a full 6-minute color film on the frenzy, called The Beatles Come to Town. Crowds only grew, and “Beatlemania” became a regular topic in the press for years to come.